On a long weekend if we are too lazy to drive out of KL and brave through the massive traffic congestion, one of the best plans is to rent a hotel room with friends and party all night! So we opt for an one-bedroom suite in D'Majestic Place by Swiss-Garden which is an apartment-like serviced residence that can accommodate a huge bunch of people. If you are lucky, you can rent a standard room and get a free upgrade to the suite, subject to availability. 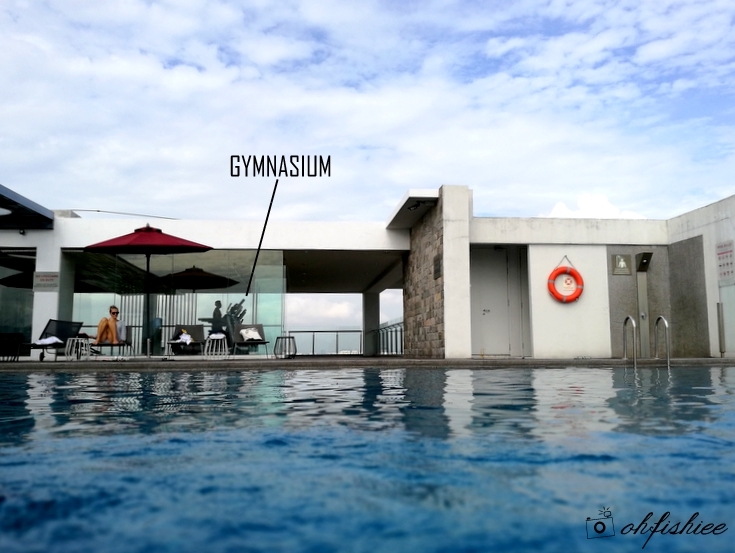 Basically, D’Majestic Place is more like a serviced residence, partially-equipped with hotel grade facilities and serving as a home away from home too. Our suite appears to be more like an apartment – Clean and fully furnished. It is separated with sections – Bedroom, shower and toilet, dressing room, living hall and kitchen – and each section is pretty decent in terms of furnishing. Our bedroom, with a floor-to-ceiling glass window on one side, and a bath area on the other side, is supposed to offer a “fantastic panoramic city view” but unfortunately the construction sites had taken over the scene. TV, wardrobe, dressing table, hairdryer etc are the basic things we notice in the bedroom and dressing room. Moving on to the bath area, the standing shower area and toilet are separated. Clean and decent. Nothing too expensive-looking nor shabby, just nice to use for a night or two. Complimentary in-room WiFi connection is available, but the speed is pretty disappointing. (for swimming perhaps) from the hotel reception. The living hall area is the perfect place to chill with a huge group of friends. You can have it decorated and pimped up for your party, or use the sofa as an extra bed for your guests. The fact that it does not offer any in-room catering services is compensated with a vast kitchen area fully equipped with fridge, electric kettle, cutleries, washing machine, microwave oven and electric stoves. If you feel like cooking or heating up your own food, by all means, just go ahead. Outside the suite…we don’t see much things to explore in the hotel. The hotel lobby is minimally furnished, nothing much to shout about. There is a café on the 6th floor but don’t expect a 5-star dining there. 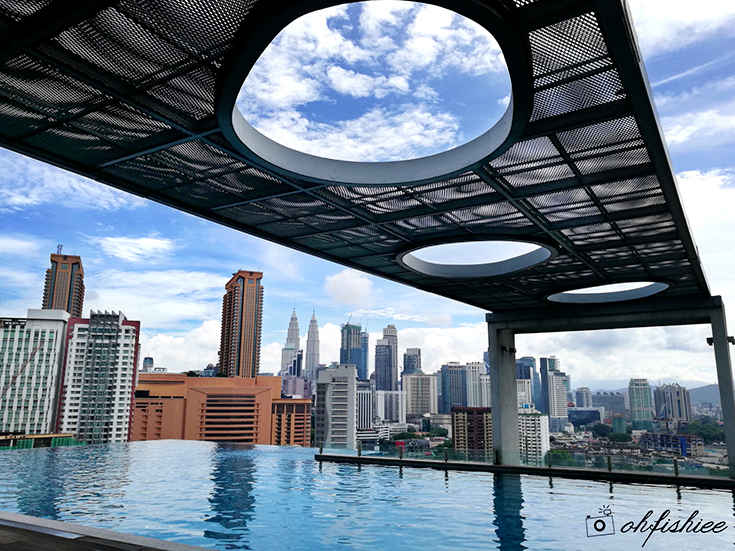 The only highlight of the facilities is the rooftop infinity pool located on the 20th floor, overseeing a not-so-great city skyline (because the beautiful view is marred by the ongoing constructions). Nevertheless, it is fun to chill with a group of friends in the pool especially in the evening, as the swimming pool closes at 10pm everyday. Gym is right next to it, if you need a quick, basic workout. Location wise, it is located slightly off the city centre but transportation is pretty easy here. Surrounding the hotel is a cluster of famous Pudu street food stalls which have been around for decades. My favourite is PMK Dessert Restaurant which serves really good old-school kuih and fried glutinous rice. 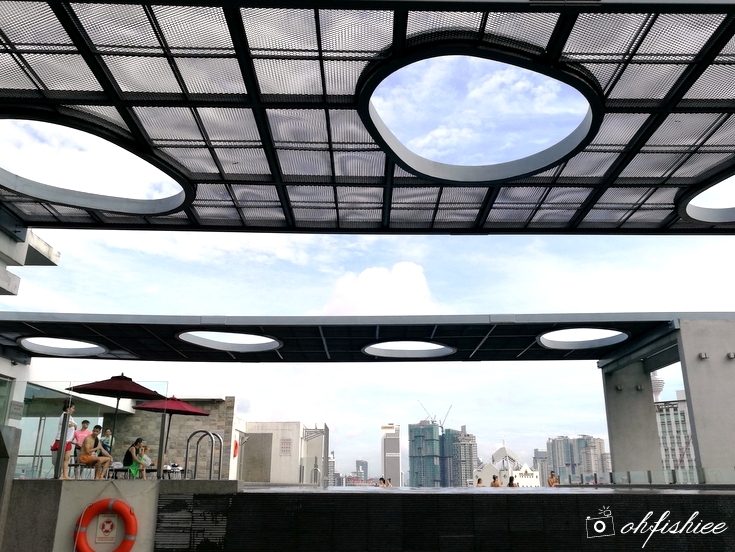 Although it is located only 5-minute walk away from Pudu LRT Station which can easily link you to other tourist attraction points in the city, an umbrella would come handy during both sunny and rainy days. Despite of the shortcomings, D’Majestic is a decent budget option to consider if you just need a place to sleep and shower, especially when space and price are your main concerns. Reasons to stay? Huge rooms, affordable rates, and infinity pool!